Other shareholders of the McLaren Group will ask Ron Dennis to step down as chairman and CEO of McLaren today, reports the BBC. Dennis has been involved with the McLaren Formula One team since 1980, and in a central leadership role there since 1981, leading them to 10 drivers’ championships and seven constructors’ championships. Naturally, Dennis, who owns a 25 percent stake in the company, is against the move. Last week, Dennis failed to convince the High Court to block an effort to put him on “gardening leave,” per the BBC. Now, shareholders will determine the nature of Dennis’ departure from the company. Dennis had a falling out with longtime business partner Mansour Ojjeh, who holds another 25 percent stake in the company and has been a shareholder in the team since 1984. The remaining 50 percent is owned by Bahraini investment fund Mumtalakat, who Ojjeh reportedly convinced to side with him on forcing Dennis to step aside. We have reached out to McLaren for comment and will update this post if one is received. Dennis’ heavy-handed leadership style has been cited as one reason for replacement, reports the BBC. The Formula One team has been floundering, in part due to McLaren pressuring Honda to enter as an engine manufacturer before they were ready. McLaren’s engine deal with Mercedes ended in 2014, and thus, they wanted Honda to be ready as soon as possible—and Honda clearly hasn’t been. 2015 was the team’s worst season. Worse yet, Dennis failed to secure a new title sponsor for the team after Vodafone left in 2013, forcing the stakeholders to doubt his ability to lure sponsors to the team. Dennis recently recruited Jost Capito from the über-successful Volkswagen Motorsport World Rally Championship team as the CEO of McLaren Racing, who just started in September. Capito’s future may be up in the air when Dennis steps down, as he was closely linked with Dennis. Because of McLaren’s need for wheelin’ and dealin’, motorsports marketing figure Zak Brown has been named as one potential replacement, despite also being rumored as one of Bernie Ecclestone’s eventual replacements on the commercial side of F1. However, those close to Brown claim he’s more likely to accept the role at McLaren, per the BBC. No reports mention Dennis giving up his 25 percent stake in the company, however, so while he won’t be in a leadership role, reports suggest that he isn’t completely leaving the company. 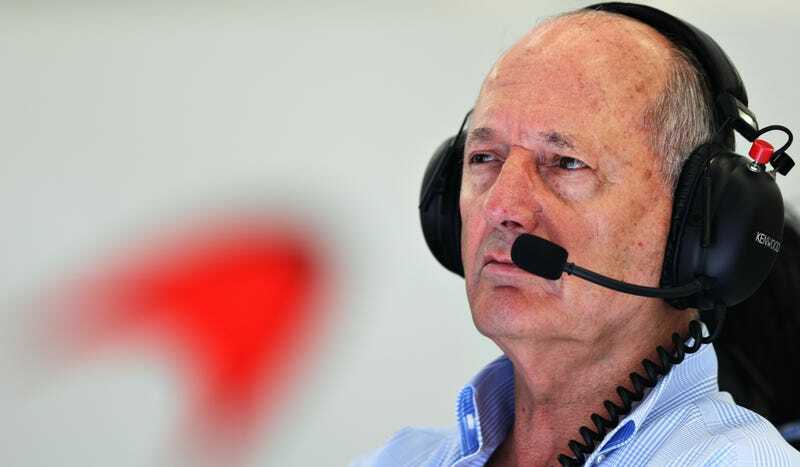 UPDATE: Ron Dennis confirmed to the BBC that he quit as chairman and CEO of the McLaren Technology Group after the other shareholders demanded it of him. Dennis said the other main shareholders “forced through” the decision “despite the strong warnings from the rest of the management team about the potential consequences of their actions on the business”. Dennis will remain on the boards of the McLaren Technology Group and McLaren Automotive as he is invested in both, and he says he will continue to work for the growth of both. However, he also plans to launch a new technology investment fund once his contract with McLaren runs out. McLaren Technology Group is now in the process of seeking a new Chief Executive Officer. Until such an appointment has been made, the company will be run on an interim basis by an Executive Committee comprising the Group’s majority shareholders, in close collaboration with the Board of Directors and the senior management team, all of whom remain utterly committed to the company, its partners, its employees and its fans, and share a passionate determination to build on our many strengths towards future prosperity. That’s some job ad. Are you the next McLaren CEO? Apply now!